Before starting this review I must inform you that I’m completely in love with Glen R. Taylor’s lite products for Pathfinder. While this augury is about only one of his ebooks – DragonCyclopedia: The Mage – after reading it I quickly bought other two products (that I’ll be also the target of new auguries at this humble tower). 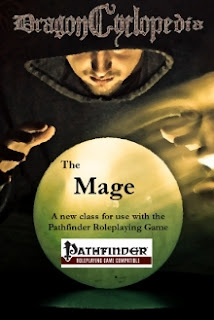 In this small PDF (just 21 pages), Glen introduces a new arcane spellcasting class: the mage. Visually, the product is very simple: pages resembling an old scroll with Public Domain art. Thematically, it’s a very interesting and original base class for Pathfinder. Glen’s proposal is to find new ways for dealing with resources and mechanics like spellcasting. The Mage is just an excuse to present a new slot-based spellcasting system. This arcane caster isn’t limited by daily allotment of spells, but he must prepare individually each spell he’s about to cast. For example: A 1st level mage can, theoretically, cast an unlimited number of 1st level spells per day. However, before casting each spell he must spend a full-round action preparing it. Another catch: a mage can only have one prepared spell each time. High-level mages can prepare spells more quickly, the exact time varying by spell level and class level. More examples: a 5th level mages can cast wizard/sorcerer spells from 1st to 3rd level; he needs of a full-round action to prepare any 2nd or 3rd level spell, but only a standard action to prepare a 1st level dweomer. The idea is simple and very interesting and I’m not sure of it’s properly balanced, although I really enjoyed reading a new approach to spellcasting that isn’t just a disguised spell point system. A high-level mage seems to me be very powerful and amazingly versatile – a 15th level mage can prepare 1st/2nd spells a swift action and 3rd/4th spells with a move action. Outside of combat, these characters will clearly be superior to standard spellcasters. Mages learn new spells by gaining new levels or by studying, which requires time and money. The class – following Pathfinder design – has a number of talents, allowing some customization. Some of these are almost obligatory, like Additional Prepared Spell, which let the mage prepare a second spell. Mages have Colleges of Magery, which are the class’s equivalent to the wizard’s arcane schools. Each colleges grant additional talents. DragonCyclopedia: The Mage also give some insights and suggestions for playing the new class, besides 2 new magic items. The PDF costs just 1 dollar and it’s an excellent acquisition for Gamemasters interested in new mechanical approaches for their Pathfinder games. Proceeding with the adventures of the Hammers of the Dawn company, while they climb the Mountains of Eternal Fire. The army left Baer’s Tower for the Eye of the West. The Hammers of Dawn (our heroes) marched behind the Sentinels (the city guard). Together with them marched other adventurers companies: the Circle of El’dar and the Knights of the Mug; both inexperienced groups. Ahead went the Daughters of the Unicorn – ashkatani (amazons) mercenaries from the far western nation of Cimeris –, the evangelist adventurers of the Gotêintor’s Avengers and the fey wanderers of the Emerald Champions. Scouting the Road Marshal’s army was the mission of the vanyr barbarians of the Red Wolves. The dwarven renegades of the Erased Rune guarded the rear. Finally, far ahead – beyond the scouts – marched alone the dwarves of the Stonefists. They refused to take part of an army that accepted “exiled bastards”. As true citizens of Karn (the greatest dwarf nation of Aldar) the Stonefists followed the Khanardon – a divine-inspired (and extremely long) code of honor and warfare. Besides light earthquakes – common at the Mountains of Eternal Fire – and the roaring of some unseen draconic beast, the first day of the march went without incidents. Heian and the Red Wolves found the dismembered bodies of goblinoid scouting parties, together with a rune from the heroes of the Company of the Black Lantern. The first resting spot of the army was a small plateau surrounded by strange natural pillars called “The Three Giants”. There’re no sign of the Stonefists. While the army prepared to camp, the Hammers were consulted by the Knights of the Mug. Their leaders – the human fighter Heltz and the half-elf sorcerer Darius – heard about the Hammers’ discovery of an aldarian temple below the village of Silvery Palms and wanted information about a magic item that they found some months ago: a small metallic pyramid whose surface seem to be made of solidified mercury (the same type of alloy used in the aldarian temple doors discovered). Before further investigations could be made, the young vanyr archer Beolrus (from the Red Wolves) informed the party that he found tracks left by the Stonefists and suspected that the dwarves were in trouble. In fact, Beolrus also found an improvised dwarven grave close to the Giants. Karnite dwarves only made impromptu graves when pressed by close combat – the act of burying fallen comrades was considered sacrosanct by the Kharnadon. The Hammers went after their allies, together with Beolrus, his sister Beltia – an ash wizard from Vanidrad –, and a druid from the Circle of El’dar called Cadimus Beren. Following the trail they’re ambushed by goblinoids, but the ensuing battle proved easy. Interrogating the survivors, they learned that the goblinoids were actually hunting a strange beast that was causing great causalities among the tribes – apparently some living legacy of the War of the Dark Banners. Short after this encounter, they heard sounds of battle and, following it, found both goblinoids and dwarves fighting a giant and deformed cat-like creature. The monster itself was tough and the goblinoids took the opportunity to attack the adventurers. Heian heavily wounded the beast but only escaped death due to the intervention of the blind monk Nogard. The Stonefists, once reunited with the Hammers of the Dawn, informed them that the cavern where they sought refuge from the beast was actually its lair – there were a small treasure therein from its past victims. Back to the army camp, at night, the Hammers helped the Knights of Mug with the investigation of the mysterious mercurial pyramid. Heian and Garet managed to activate the small artifact after a few minutes handling it. Each of the pyramid’s face opened, revealing a small crystal octahedron grafted on its metal surface. By touching the crystal, Heian was teleported to strange chamber, whose walls seemed to be made of transparent steel. Beyond it shone strange and alien starts. 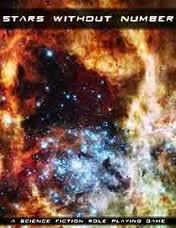 The chamber had the form of a tetrahedron and floated on the dark void. The elf saw that one of the chamber’s walls possessed a diamond-shaped mirror. Looking through it, the fey saw the giant faces of his worried companions. A sound at his back startled the wizard. He noted that he wasn’t alone. Inside the strange chamber was a human duelist called Farduf. He was resting over some pillows at one of the room’s corners; a crystal ball at his side. Farduf explained that he was a member of the Knights of Mug, trapped inside the artifact for what appear to be an eternity – nor hungry or fatigued could touch him while in the room. Heian studied the crystal ball and managed to use his magic to get Farduf out, but the fey himself remained trapped. Outside, the Hammers meet Farduf, who learned that his imprisonment in the artifact lasted almost three months. Feeling cheated, the aasimar Hilguen almost started a battle with the Knights of the Mug – the paladin felt that his group was used. After all heads cooled down, more mages – including the warbard Mellius himself – came to help. At the end of this eldritch conclave, Heian was rescued with the help of Ordo, the wizard that followed the ashkatanis (Ordo was the only men among of the mercenary group or, as they Hammers put it, “the luckiest man” in the army). While these events took place, the camp was assaulted by undead shadows, sent by the Master of the Goblinoid Horde. The attack was quickly repelled when Hilguen discovered the shadows’ origin in an iron ball, hidden at the camp’s border. On the following day, the army was again attacked – this time by a big red drake. The beast was fended off only by the joining efforts of Hilguen’s Divine Spark and lots of dwarven ammunition. During the battle, many dwarves from the Erased Rune were saved by Nogard, quickly becoming friends with the hian monk. The rest of the day went without further delays, the last rays of the Twin Suns revealing the high spire of the Eye of the West – the lighthouse-fortress sought by the army. Precisely at this point, just a few hundred meters from the safety of the iron gates, the army was hit by rains of goblinoid arrows, followed by a barbarian charge. The Horde sprung from nowhere, as if by magic, rising from the surrounding hills and crags, which melted before the heroes’ eyes. Sometimes your glib scoundrel doesn’t have the time to actually worm his way out of a dangerous situation… just because, somehow, the orc’s big axe was quicker than his tongue. No more! You can spell “The Ixitxachitl is itching for which witch?” thrice than most master swordsmen can draw their blades. Prerequisite: Dex 13+, Cha 13+. Benefit: If you’re conscious and not suffering of any speak- impairing or mental condition (like confused) you can, at the first round of any combat, choose to gain a special action and act before all other participants. You must declare, after rolling initiative but before anyone has yet to act, that you’re using this feat. The special action is a standard action that must be used solely to make a Diplomacy or Bluff check. These skills work under the normal rules. You can’t use this feat if you’re surprised. If two or more characters possess this feat and declare that they’re using it, roll a second initiative just among the “talkers” to determine who speaks first. Remember that a character can choose to go last, to better undermine whatever the other character is going to say. This feats was inspired by the Doctor Who RPG (which I hadn’t yet read), where talkers go before combatants. It’s a nice way, in my opinion, to valorize pacifist (or mellifluous) characters. Only Clueless don’t pay attention to the fundamental rules of the Multiverse, berk. In 4462, the great chieftain Galstak Sevendeaths (who was resurrected six times) brought together the Sklar-Quah and Skoan-Quah to form a small army. This army crossed the Jeggare several miles upriver from Korvosa. 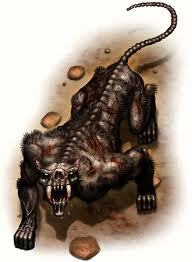 Riding massive dire animals, the Shoanti crashed through the forest and burst onto the farmlands southeast of the city. The Shoanti raid, coupled with their subsequent weeklong siege of Palin’s Cove and the Chelish mainland enclave in Korvosa, reignited anti-native feelings among the settlement’s leaders. The entire regiment of Korvosan Guards stationed on Endrin Isle marched straight into the heart of the Shoanti encampment, driving the savages back across the river. Over the next 26 years, a state of general war existed between the Shoanti and the Korvosans. Finally, in 4488, the Korvosan Guard once again killed Galstak Sevendeaths, but this time they managed to capture his body and prevent his eighth return to life. With Galstak’s final demise, the alliance he formed crumbled, and the tribes quickly fell to in-fighting, even as they f led north and east at sword-point. The Chelish soldiers firmly established their dominance of the area around the mouth of the Jeggare River. Kobold Quarterly special 100-pages edition is here, with probably the best cover in the magazine’s history. It’s literally gorgeous and with a classic touch that reminds of the best covers of DRAGON. However, you may take this compliment with a grain of salt as I recently discovered that I’m a total fan of Kieran Yanner color art – especially when it deals with dragons. In Wolfgang’s editorial we get the confirmation that this is a dragon-themed issue and how “jerky” these mythical beasts can be – which always increase exponentially the fun of hunting and slaying them. Steve Kenson’s Gift of the Gods, for the AGE system (from Dragon Age ), has probably the beast take on divine characters for fantasy RPGs. Instead of using a cleric class, we got different “templates” of divine champions that can be applied over warriors, rogues and mages. This approach is in my opinion perfect for Sword & Sorcery games. We also get new rules for Divine Stunts. The next article is a full base class – the Savant proposes to be a “jack-of-trades” class. The Savant has medium Attack Bonus (and d8 as HD), good Fortitude and Will saves and a good selection of skills (including all knowledge skills). The class’ abilities are based on trades or roles that a Savant keeps on his notebook – these grant access to knacks or powers, which range from buffs, abilities of other classes to even spells. 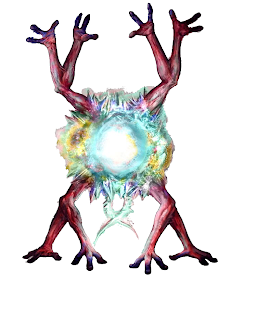 The Savant also possesses numerous unique abilities, like the invoking Avatars of Legend – special cohorts. It’s a difficult class to grasp with a first reading as it’s really very open-ended. My personal beef with the Savant is similar to my problem with the Factotum class from Dungeonscape – they’re too “metagamic” for me. I know that they were made to be “chameleon classes” but the way the authors choose to grant their abilities doesn’t make any sense to me within a campaign setting’s verisimilitude (i.e. the Savant/Factotum is just a bunch of cool powers put together and called a “class”, without any cohesion or logic). This Kobold Quarterly brings solo adventurers – which are always fun to play, particularly for those of us that played Fighting Fantasy books. This issue’s Ecology article is for D&D 4th Edition and deals with the minotaur culture of Midgard, keeping the setting’s excellent tradition of mixing lesser know mythologies and legends with edgy and interesting twists. The minotaurs of Midgard are clearly Greek-based, with a lawful mindset and a deep hate of dragonkind. For the rules-minded reader, there’re new divine boons for the horned champions. Now, my favorite part of this Summer issue – “The Exorcists” is a fiendish non-orthodox 1st level adventure that will probably drive your players made. It’s that good! To give you (a vague) idea of the adventure, it puts the player characters against a demon-possessed golden dragon. 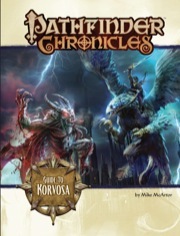 It’s a wonderful one-shot design, something that I rarely see done with Pathfinder. The next article is also for Pathfinder and presents the Dragon Hunter prestige class. No more commentaries needed. Going back to the 4th Edition we get rules for siege engines and game advices for running your classical Sherlock Homes mysteries with fantasy elements. Yet on the D&D, there’s a very interesting article on the esoteric (and infernal) art of selling souls and the benefits found therein. On Pathfinder now, we have rules for syngergistic magic – how to combine two spells in one. Monte Cook’s Game Theories talks about how the Gamemaster deals with suspension of disbelief within his group – especially when certain fantasy elements or aspects are considered almost “physical laws” by most players. “Battle Wizards and Sword Maidens” brings a list of asian fantasy movies that should give good ideas for Gamemasters and players alike. Another systemless article is “10 Reasons Why Your Character Should Be In Jail” – some quite original in RPGs like being arrested for NOT carrying a weapon, missing church or draft dodging. “Into the Dragon’s Den” has rules for introducing aura spell-like abilities – supernatural traits shared by a dragon’s allies (or any creature) inside the monster’s lair. 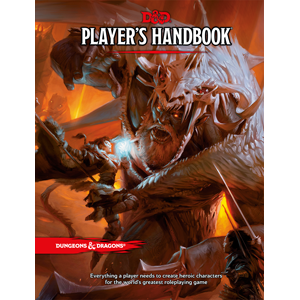 The article provides rules for Pathfinder and D&D 4th. “The Heroic Flaw” introduces character traits for D&D 4th in the form of background elements (like Otherworld Pact or Code of Honor) which – when responsible for the good roleplaying or some noteworthy action – results in the player gaining Trait Points to spend in temporary bonuses (it’s very similar to Fate Points, from the FATE system). “Who Watches The Watch Fires” is a 4th Edition adventure for paragon characters of 4th level. “Beast Masters” is a great article for Pathfinder that provides an alternate version of the Leadership feat focused on beast companions, including the much needed guidelines for awakened animal cohorts. Still on Pathfinder, “Cavaliers of Flame and Fury” describes 2 new draconic cavalier orders for the Midgard setting. Finally, “Wings, Scales, and Claws” details the weird dragon knows as the Kharalang that haunts the Rothenian Steppes of Midgard. As usual with all Free City of Zobeck articles, we get one page of pure flavor and adventure ideas, based on Eastern Europe (or One Thousand and One Nights) legends or style. Ok, this is a house rule that I never used but always tinkered about... I remembered about it because of a topic on RPG.Net about funny bugs of rules systems (it’s hilarious, check it out) where a member commented that in D&D (3.5, Pathfinder or “lower” editions) the higher your level and your health (Constitution) the more time it took for you character to heal. Common sense would lead us to think the contrary – I know, it’s dangerous to use that word on RPGs, but you know what I meant. The 3rd Edition already improved upon the original system, by stating that a character recovers his level per day instead of just 1 hit point. While I don’t see the need to improve this, I also believe that there’s no harm in changing this rule to “Your character heals his level plus Constitution modifier (minimum 1) per day of rest. Any character is completely healed after a month of rest, no matter how many hit points were lost”. Now, the real change. Cure spells. I already proposed a suggestion about how to really abstract hit points, divorcing them from physical wounds. This house rule attempts to do the same and can even be utilized with that subsystem. Here’s how it works: cure spells now heal in proportion to a character’s Hit Points’ total. Cure light wounds heals 1d8 damage + 1/level (max +5) or 10% of the character’s full Hit Points, whichever is higher. Cure moderate wounds heals the usual amount or 20% and cure serious wounds heals 30%. Heal either heals 10 hit points/caster level (maximum 150 hp) or 60%. 6th level Fighter with 50 hp + cure light wounds by a 5th level Cleric à 9 hp healed or 5 hp (10%) = No improvement. 6th level Wizard with 30 hp + cure light wounds by a 5th level Cleric à 9 hp healed or 3 hp (10%) = No improvement. 10th level Fighter with 85 hp + cure light wounds by a 10th level Cleric à 9 hp healed or 8 hp (10%) = No improvement. 10th level Wizard with 48 hp + cure light wounds by a 10th level Cleric à 9 hp healed or 4 hp (10%) = No improvement. 15th level Fighter with 130 hp + cure light wounds by a 10th level Cleric à 9 hp healed or 13 hp (10%) = Slight improvement. 15th level Wizard with 70 hp + cure light wounds by a 10th level Cleric à 9 hp healed or 7 hp (10%) = No improvement. 20th level Fighter with 180 hp + cure light wounds by a 10th level Cleric à 9 hp healed or 18 hp (10%) = 100% improvement. 20th level Wizard with 90 hp + cure light wounds by a 10th level Cleric à 9 hp healed or 9 hp (10%) = No improvement. 6th level Fighter with 50 hp + cure moderate wounds by a 5th level Cleric à 9 hp healed or 10 hp (20%) = Slight improvement. 6th level Wizard with 30 hp + cure moderate wounds by a 5th level Cleric à 9 hp healed or 6 hp (20%) = No improvement. 10th level Fighter with 85 hp + cure moderate wounds by a 10th level Cleric à 9 hp healed or 25 hp (20%) = Great improvement. 10th level Wizard with 48 hp + cure moderate wounds by a 10th level Cleric à 9 hp healed or 14 hp (20%) = Great improvement. 15th level Fighter with 130 hp + cure moderate wounds by a 10th level Cleric à 9 hp healed or 39 hp (20%) = Great improvement. 15th level Wizard with 70 hp + cure moderate wounds by a 10th level Cleric à 9 hp healed or 21 hp (20%) = Great improvement. 20th level Fighter with 180 hp + cure moderate wounds by a 10th level Cleric à 9 hp healed or 54 hp (20%) = Amazing improvement. 20th level Wizard with 90 hp + cure moderate wounds by a 10th level Cleric à 9 hp healed or 27 hp (20%) = Great improvement. That with a 2nd level spell, nothing bad, huh? However, if you believe that this is too much, I offer a second option: each cure spell has 2 versions – a combat version and a ritual version. The ritual version has a casting time multiplied by 10 (usually 1 minute) but has the potential of healing more (at higher levels). Well, that's it. I hope this idea can be of help to you. I usually don't do posts like this, but I can't let the opportunity pass. d20pfsrd.com is running for Best Website this year and it's an excellent tool for all Pathfinder Gamemasters and players (it definitely helps me a lot). So, please, if possible, pass by and give these guys a vote. Weird Arcana - Temple Magic! I think that the Spell Components rule is a great way of not only giving flavor to dweomers but also of balancing spellcasters. If you read any occult or mythology book you’ll see that there’re a thousand intricacies, peculiarities and limitations to the casting of the most famous (and powerful) spells. While Pathfinder is obviously a game, I love to thinker with the Spell Components mechanic in such way. The spell below uses a new Component (“L” to “local”) and is based on an old idea of my – that clerics should be a lot more dangerous inside the houses of their deities. You can now invoke easily the domains under the power of your deity. For the duration of this spell, you can cast all your domain spells spontaneously (like the rules for spontaneous casting). If you already can cast a particular domain spell spontaneously (for example, you’re a good cleric casting cure spells), then invoke the lesser potencies lets you add one of the following metamagic feats for free (even if you don’t possess the feat): silent spell, still spell, enlarge spell, extend spell or reach spell (only increase one range category). After the duration of invoke the lesser potencies ends (or if it’s dispelled), you become exhausted. A cleric that cast invoke the lesser potencies more than once per day risks divine wrath. Local Component: invoke the lesser potencies can only be cast inside a temple dedicated to your deity with hallow/unhallow spell. You invoke the powers of your deity to focus your divine magic. For the duration of this spell, you can cast any spell from your list spontaneously (like the rules for spontaneous casting). If you already can cast a particular domain spell spontaneously (for example, you’re a good cleric casting cure spells), then invoke the higher potencies lets you add one of the following metamagic feats for free (even if you don’t possess the feat): silent spell, still spell, enlarge spell, extend spell or reach spell (only increase one range category), heightened spell (only one level higher), selective spell or disruptive spell. After the duration of invoke the higher potencies ends (or if it’s dispelled), you become exhausted. A cleric that cast invoke the higher potencies more than once per week risks divine wrath. Local Component: invoke the higher potencies can only be cast inside a temple dedicated to your deity with hallow/unhallow spell. I never had problems with the original 3.0 (and 3.5) Grapple rules and love to used sometimes to remember the fighter and barbarians of my group that there're things more scary than big attack and damage bonuses. While I loved Pathfinder unified mechanic resolution system (the CMB and CMD stats) there're a few things that still irk me. For example, in D&D 3.5 you had first to touch the target before you could grapple with him, which was very reasonable to me, because it made small targets hard to catch but easy to grapple and big targets easy to touch but hard to subdue with Grapple maneuvers. With the unified system of Pathfinder, the touch attack was removed, creating these weird situations where a small and evasive things like a pixie or quickling are ludicrous easy to capture (I know you can use Escape Artist to counterbalance this, but this skill presupposes that the target was already captured). Maybe I'm worrying too much with the wrong thing (i.e. realism), but the latest consequence of these musings are posted here for your perusal. Your use your body mass and vigor to compensate for you agility. Benefit: You can substitute your Constitution bonus modifier for Dexterity to determinate your Combat Maneuver Defense (CMD) against bull rush, drag, grapple, overrun and trips maneuvers. Commentary: I'm using the assumption that Constitution is - on this particular situtation - related to mass and bulk. In order to avoid some strange scenes (titan gnomes in Pathfinder if you want), I added a size prerequisite. You can use your size to evade your opponent and escape from grapple. Benefit: Against opponents bigger than you you gain a bonus to your CMD when suffering grapple attempts. This bonus is based on your size: Small +2, Tiny +4, Diminutive +8, Fine +16. Commentary: This feat assumes that a small and agile creature is harder to catch and grapple. As said above in Pathfinder's Combat Maneuver mechanics small creatures are ridiculously easy to capture, which seems counter-intuitive to me (it should be hard for an ogre to catch a halfling, much less a pixie). At least in D&D 3.5 a creature had to make a successful attack roll before rolling grapple. With the unified Combat Maneuver mechanic this attack roll is dismissed. What this feat do is basically to negate any penalty derived from size with little creatures, besides giving them a bonus similar to the one possessed by large creatures. This bonus only applies to the CMD and even them only when they're the target of a grapple (in other words: halfings, pixies and the small folk are still terrible grapplers). The Book of Drakes is probably Open Design’s must visually stunning product so far. The beautiful cover art by Kieran Yanner – one of my favorite artists – is justification enough for buying this Pathfinder supplement. Consider the rest of it a very (very!) generous bonus. 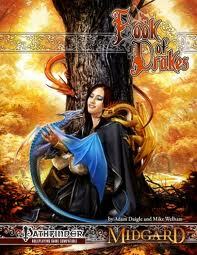 The Book of Drakes is 58 pages color sourcebook, with light brown pages. The inner stylized layout is discreet, very well done, without overloading each page. The inner color illustrations are also very flavorful, capturing easily the drakes’ whimsical nature. This review is based on the bookmarked PDF version of the supplement. I must confess that I was skeptical at first about this sourcebook. While I love pseudodragons, I had many doubts about the viability of an entire product dedicated to them. I’m glad I was wrong. The Book of Drakes is not only full of new and very useful rules, but also managed to make lesser dragons an interesting and varied subject. The first chapter – the Ecology of the Drake – gives the author’s take on drakes: lesser draconic creatures aligned with nature materials (ash and steam), regions (mountains and rivers), objects (gears, libraries) and esoteric themes (moon and lycanthropy, for example). What make these creatures so interesting is that drakes seem to manifest around many forces or concepts important to humanoid civilizations – like the candle drake. This creates a new niche for the little dragons in Pathfinder games, clearly differentiating them from their greater cousins and other monsters. Another positive point for the Book of Drakes are its tables: simple, fun and very useful. Right at the first chapter we get a cool table on “drake treasures” and other on “unclassified drakes” (that goes very well with new rules for creating drakes, further ahead on the supplement). Chapter two is about mechanics, we get new feats for drakes and rules for using drakes as “willful companions” (a nice variant of the cohort mechanic, but where the player character must constantly bribe and cajole his lesser dragon), spells, magical items and new gear. Some of the new feats are generic and useful to any character. There also new alternate class abilities – like breath-weapon as a rage power for barbarians and (my favorite) a new performance that let bards becalm creatures; cavaliers get a new order, oracles get draconian curses, paladins get a “dragon challenger” variant, sorcerers get a drake bloodline etc. Finally, we have an entire alternate class for the summoner – the Drake Tamer; and a prestige class. Most of the mechanics are top-notch in regard both to their themes and they way they’re implemented. Closing what is for already for me a perfect chapter there’re rules for playing pseudodragons and drakes (finally a tiny race option for player characters). Chapter three is for Gamemasters and includes a bestiary of 19 new drakes, among the hostile ash drakes, the rampaging crimson drakes and the probably adventuring party-favorite alehouse drake (best breath-weapon and special abilities… obligatory for tavern scenes). The drake’s CR range from 1 to 14 and include creatures of all types of alignments – many deserve an entire adventure about them (like the moon drake). However, the highlight of this chapter are rules for constructing your own drakes (together with a full example – the vine drake), including a mechanic of feature points designed to better customize the scaled pests. The Book of Drakes is a great product, with a good price for its quality and content, which will add color to any campaign; in fact, the Gamemaster now runs the risk of finding himself with an overwhelming presence of lesser dragons on his game*. *To my luck, one of my Pathfinder games is based on Korvosa , a city from the Golarion campaign setting, famous for its native pseudodragons. Here is the last Aeon encounter for the Pathfinder Bestiary 2 . I’m really tempted to skip the alphabetical order, otherwise I must prepare myself to do some serious brainstorm because the next entry are Agathions (it’s hard to write encounters for good outsiders). This encounters starts with what appears to be just another magic item: a delicate magic crown. Actually more a diadem than a crown, this jewelry is made of finally interlaced mitral trends adorned at the center by a beautiful piece of diamond shinning with kaleidoscopic colors. This item has a powerful divination and conjuration aura and caster level 12th. The magical propriety of this item is simple but powerful: it allows its wielder to roll twice any check (except damage rolls) and pick the best result. Any character with Knowledge (History) can roll to discover more about it after a DC 20 check. The item is known as the “Crown of the Ascended Monk”, because of an ancient and saintly monk responsible for leading a rebellion or for overthrowing a local tyrant (pick the best option for you campaign). Legends claim that this monk could assume an “avatar-form” with red skin, extra arms and a “holy crystalline aureole”. The tales affirm that the monk ascended to the Outer Planes after his good deeds. If the character succeeds at the History check by 5+ he remember the name “Theletos” associated with the legend. If any character asks for a Knowledge (Planes) he can discover that that is the name of a type of Aeon. Finally, if a character succeeds at the History check by 10+, he remembers a far older tale about a cruel slaver called named “The Lord of the Crystal Crown” who also weared the magic item. The Crown is actually a cursed magic item, for its crystal is the extraplanar prison of a type of Aeon devoted to the duality of freedom and slavery, fate and free-will, called a theletos. This particular theletos, who calls himself “Harmonious Balance”, always searches for powerful individuals to use as tools on its manipulations across the Material Plane. To reach this goal, Harmonious Balance allow itself to be trapped in the Crown in first place; because through it the Aeon can use its spell-like and supernatural abilities agaisnt the Crown-bearer without making attack rolls (and all saves made by the victim suffer a -2 penalty). Usually Harmonious Balance attempts to bind its wearer with a lesser geas and force him to champion either the cause of freedom or of tyranny – it all depends on which force is weaker at the time. Harmonious Balance also deeply despises diviners and oracles, constantly sending to the Crown-wearer visions of doom and potential calamitous futures created by these fortune-tellers. While motivating its victim to fight for freedom or tyranny, Harmonious Balance also sends constantly images of the possible consequences of the character’s inaction (sometimes, the Aeon may even be right). If the Crown-wearer helps the Aeon he'll also benefit of the outsider magical abilities (Harmonious Balance can cast spell-like abilities like bestow curse, remove curse or dispel magic at enemies or allies of the Crown-wearer). If the character at some point decide to destroy the Crown, Harmonious Balance will manifest and strike against them. Unfortunately I read much more than I game these days, in part because I’m a voracious collector that buys things with any cohesion, sense or ultimate purpose besides reading good RPG stuff. However, of late I’ve tried to organize myself in order to get players (it’s because of that that I’m reading again the Pathfinder Core Rulebook and the Crimson ThroneAdventure Path, as well REIGN). As I haven’t been reading nothing precisely new – even Starts Without Number has been around for some time –, I thought about talking a bit about each of these games instead of writing full auguries (the second reason is that I’ve been very busy lately and I’ll travel tomorrow to spend the weekend with my girlfriend and my parents). Ok, with this one I really want to do a full review. It’s, after all, the first brazilian retro-clone and I want to indulge in a little patriotism (besides, it such a cool game). 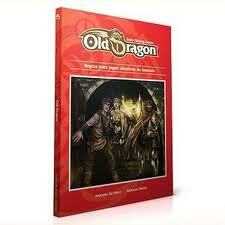 Old Dragon isn’t precisely a retro-clone as it doesn’t attempt to emulate any of the older editions of D&D. It certainly seeks to follow the Old School Renaissance, but more on the line of games like Basic Fantasy. 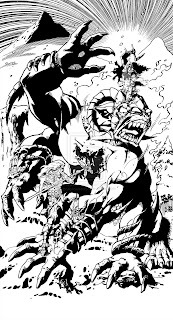 Old Dragon has the basic four classes (even with percentage skills for the thief), together with the classical races (although with modifiers in the D&D 3.0 range). However, it has distinctive characteristics. For example: all monsters have stats. In many aspects Old Dragon feels like a mix of Basic D&D and D&D 3rd Edition (but without feats or skills). 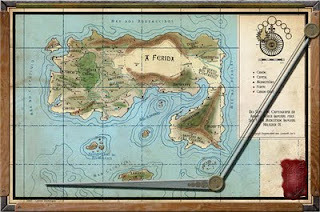 The advanced classes of the game – as mentioned in Grognardia – are another of its more interesting aspects. Old Dragon is sold in booklet format – a very nice softcover, B&W, with all the information you need to run your games in one small book. 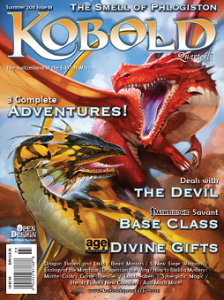 The authors, from the Redbox Editora, are supporting Old Dragon with a range of free supplements (and a pocket lite-version of the game) – all for free. This is a true classic. 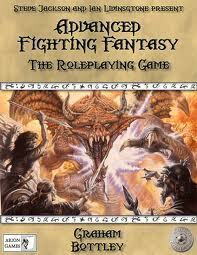 Two years ago Advanced Fighting Fantasy was responsible for reigniting my group’s enthusiasm for fantasy roleplaying. At the time we used just Dungeonner and played through the wizard tower adventure– it was a blast and one of the funniest game sessions of my life. Reading the new core book, it is fascinating to note the new rules of Arion Games and how they differ from the house rules that everyone – inevitably – creates to better suit AFF to their tastes. The now official armor rules, for example, follow the same rule of the damage mechanic: roll 1d6 and consult a table for each type of armor. The result shows you how much damage is stopped. If I remember right, the original game didn’t have rules for armor, but mentioned that each character was already supposed to be wearing its most efficient protection (and that if, somehow, this character found himself stripped naked, the Director should simply apply +1 to all damage roll against him). Pretty simple, as you can see. At my table a player once wanted to play a heavy-armored warrior, so I naturally created a new ruling for armor. I imposed a penalty on all his physical actions, but every time he was hit I gave him a 2-in-6 chance of ignoring entirely the damage delivered by a hit. That’s in my humble opinion the “magic” of the AFF system: It appears to encourage rules’ tinkering. Among the things in the new book that picked my interest (besides Talents) is the division between Sorcery and Wizard. The later are you classic spell-slinging caster with magic books and mana points, the former looks like a Howardian caster: he can use armor, his spells are weirder and require material components, and his spellcasting consumes Stamina. In the Priest section we also have one of my favorite rules – Salvation – that enables each divine caster to beg for his god’s intervention once (just once) to save his life. Excellent flavor. This amazing game by Greg Stolze uses the ORE system. For those that don’t know it, ORE is a pool system that uses only d10s (and a maximum of 10d10 for those that fear pools) and attempts to determine all the consequences of a character’s action with just one roll (then the name: One Roll Engine). Each time you roll, you look for sets (like a pair of “5” or four “3”, for example). In combat, a set tells you not only how fast you were, but also where you hit and how much damage you inflicted. It’s a great game system, although it requires some time getting used to. Anyway, REIGN’s strengths are not (limited to) its system, but its aim: wars and kingdom-building. REIGN started as criticism to common fantasy RPGs that failed to support, with rules or objectives, scenarios where the PCs eventually come to lead armies or rule kingdoms (or temples, guilds etc). Greg Stolze isn’t necessarily interested in dominion rules (“realm administration” if you like), but on dramatic mechanics to determine the power of groups and organization and how they’re affected by each other and the PCs’ actions. In this regard, REIGN fares admirably, providing an abstract and yet simple system (that can be easily borrowed by other games). 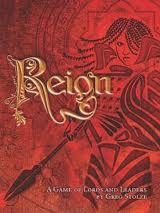 REIGN also has a weird but intriguing world setting, with a Bronze Age vibe – the continents of Heluso and Milonda. This was the hardest part of the book for me to swallow, but I’m astonished at how this surreal world has grown in my mind with the passing of the years. I read similar commentaries from other gamers about settings like Glorantha or even Tekumel and while Heluso/Milonda isn’t as rich (or as complex) as those, it’s certainly is as unsettling and mysterious. 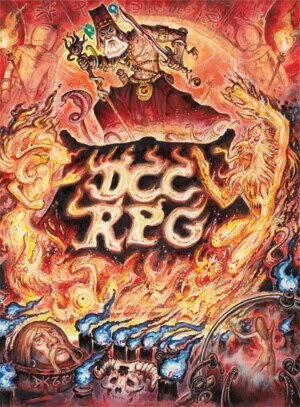 This RPG is probably one of most original and complete works born during the Old School Renaissance. You can read full reviews of it here and here. In a nutshell, Starts Without Number (or SWN) is a classic science fiction game whose system is a mix of D&D and a simple skill system. You have three classes – expert, psychic and warrior. SWN has a basic (and perfectly generic) world setting. Probably the strongest appeal of SWN to me is that it is tailor made for sandbox campaigns – and very well made I should say (it’s hard not compare it with Traveler in this regard). SWN has an amazing level of quality (for free), with rules that are concise and balanced (check the psionic system). Now, SWN really steals the spotlight with its faction’s rules: a complete, easy to use and embracing system that enables you to stat all kinds of big organizations, from religions and trade guilds to barbarian space fleets and ancient empires. This is something that I dearly miss from D&D since first reading about high-level campaigns and AUTHOR delivery it apparently effortless and – I repeat – for free! (I don’t even need to tell you that these rules can be easily adapted to D&D). 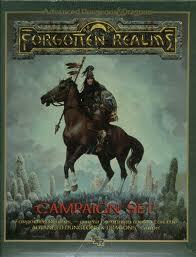 I never read the famous Grey Box, although my fourth RPG book was the Forgotten Realms 2nd Edition box. At the time I was just getting into RPGs (and AD&D) and all I wanted was Tolkien mash-ups. Forgotten Realms give me something close to that and I became used to all its complex organizations and gallery of NPCs (that I still love, specially the books released at the end of AD&D 2nd Edition). So, after reading this post at Grognardia, I hunted down a copy of the Grey Box and started reading it. What a surprise! In this first incarnation, the Realms were not only a perfect sandbox setting, but the description of all its lands and countries – small paragraphs that went direct to a region’s distinctive traits – turned to be a lot more interesting to me today than pages and more pages of background. Actually, I dare say that the Grey Box managed quite a stunt – blending Tolkien (High Fantasy) and Sword & Sorcery. Basically, you can see the North (with the Dalelands and perhaps Cormyr) as” Tolkien-ish”, while the farther you go South or East, the closer things get to Howard and Ashton Smith’s tales. There is also a pleasant absence of NPCs, with some like Elminster been treated more as a sage than an all-powerful demigods (some NPC descriptions are particularly remarkable, like the King Azoun IV, pictured here as “an effete but regal middle-aged man of sophisticated tastes and keen wits”). And now some good bad news: I have finally formed groups here in Belo Horizonte! My Curse of the Crimson Throne group (for Pathfinder) is already on the way, with three players; I’m also playtesting a generic rule system called Triad with another group (now as a player); and I hope to get a REIGN group running within two or three months. All that without abandoning my old group at Vila Velha (some 300 miles from here), where my Chronicles of the Seventh Moon campaign (for my heavy house-ruled Pathfinder, here's a sample) is entering on its 4th year. I’m trying to schedule the Seventh Moon campaign once at every three months (our next session is this Saturday!). By “bad” news I mean that, with these groups running, I’ll probably have less time to update this blog, but I hope to keep one post every three days. Let’s see if I can pull this out. Still about the blog, I’m working on a Worldbuilding article inspired by the Malazan Book of the Fallen where I propose a new vision about wizard, cleric and psionic power sources. I’ll also keep translating my Seventh Moon reports, as the last articles are recently getting more clicks. The Lost City reminds me why I tend to associate D&D 4th with missed opportunities. Just to remember: I do like D&D 4th, what really makes mad is the way the game has been handled. Since its original release, the policy behind the marketing and the release schedule of D&D appears to be targeted at alienating its player base (it certainly alienated me). Every time when I believe we’ll finally see interesting books (like the Nenthir Vale sourcebook), WotC suddenly pull things off and goes back to their “veiled agenda” method (that doesn’t inspire lots of trust). This small (and, I promise, soon to be concluded) rant is because I think that one of the foremost problems of D&D 4th is its lack of iconic settings and modules – yeah, adventures. This new edition didn’t got its Eberron – by that I mean a setting mechanically tailored to show and develop the game’s key features. To make things worse, D&D 4th doesn’t have good adventures. I admit that I played only 3 official adventures so far but I also spent I good time reading reviews of modules that I wanted to buy but soon gave up because they’re either bland or just a series of linked combat encounter and disconnected skill challenges. But this is a review… in particular a review about a sandbox D&D 4th module for paragon characters of level 14 to 17. I admit not knowing if the 4th Edition is a good paradigm for good old-fashioned sandbox settings. While sandboxes appear to work fine with Pathfinder , it gets hard to organize things on the spot due to the game’s complex creature stats (that’s why, after all, I came up with this weird house system for monsters). At least in this aspect, D&D 4th trumps Pathfinder easily in my opinion, especially if you use the famous “Page 42” rule from the Dungeon Master Guide (that’s something I think could also work for Pathfinder). The Lost City has a delicious and classical premise: the famous lost desert city, the last legacy of an ancient and advanced civilization, now sunken below the sands. It’s all a great homage to Dungeon Module B4 (even the name). However, Open Design’s product is its own beast. The sunken city of Kadralhu was actually a flying city inhabited by giants and their reptilian servants – the Oklu. Oh, and this flying city is powered by a sleeping goddess. So far, The Lost City is made of pure awesomeness. 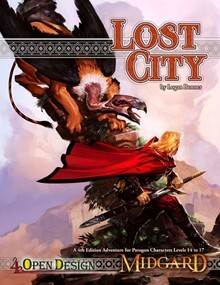 Physically speaking The Lost City is a soft-cover with 93 pages. The cover is a beautiful colored art by Kieran Yanner, while the interior is B&W, with a grey background and a two-columned text. The B&W art is also well done and reinforces the book’s flavor (specially the Oklu’s illustrations). The first chapters deals with Kadralhu’s history and its factions – surviving giants, undead giants, the Oklu, inevitables, big and intelligent larva-infecting insects and the goddess Kaima herself; all with their own conflicting interests. This approach is perfect for a sandbox setting and the history, while linked to the Midgard setting, is extremely ease to adapt to any desert of any world. Next topic is hooks for the adventurers and the most important artifacts of Kadralhu; and don’t forget basecamps for the heroes, like the classic small village closer to the ruins. 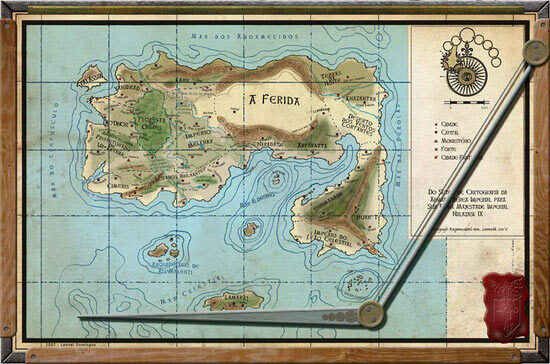 The next chapters are each devoted to a specific region of the sunken city. The first area is the Phoenix Tower (the suggested point of entry). The Lost City doesn’t use the official WotC layout for encounter, which is a bless if you ask me. The entire book reads in a clear and organic way than the official adventures of D&D. One of The Lost City’s most exotic settings is the Hanging Gardens, created when a part of the flying city fell upside-down in a local gorge. Unfortunately we don’t have many terrain features here, besides the inspired description. We also get a full chapter for the Oklu. A race of reptoid servants, the Oklu give excellent opportunities for some pretty weird roleplaying scenes, as their artificial instincts encourage the race to simulate the behavior of other intelligent creatures that interact with them. Suddenly, the player character can come face-to-face with an entire “clone Oklu party”. This isn’t necessarily bad, as there’s a good chance that these Oklu will help the group by emulating them. The Oklu are a nice and distinctive touch. By the time the party reaches Kadralhu’s heart, things start to move forward on a more step pace. At this point, The Lost City loses some of its sandbox characteristics and starts to sound like a conventional module. This doesn’t mean the book fails to provide a good adventure, quite the contrary, but this fact may go against the aesthetics of those that wanted a “pure” sandbox. To let things clear: The Lost City has a definitive end, how the party gets there and allied with whom is the great question of this adventure. Do not be mistaken, this setting gives an amazing freedom of action to the players. In certain ways The Lost City is a sincere and honorable attempt to marry Old School premises with plot-driven adventure paths. In this regard, it’s succeeds perfectly. In fact, I believe that adventures like The Lost City and Courts of the Shadow Fey are exactly the type of module that the 4th needs to show its strengths. Worldbuilding - Downward to Glory!